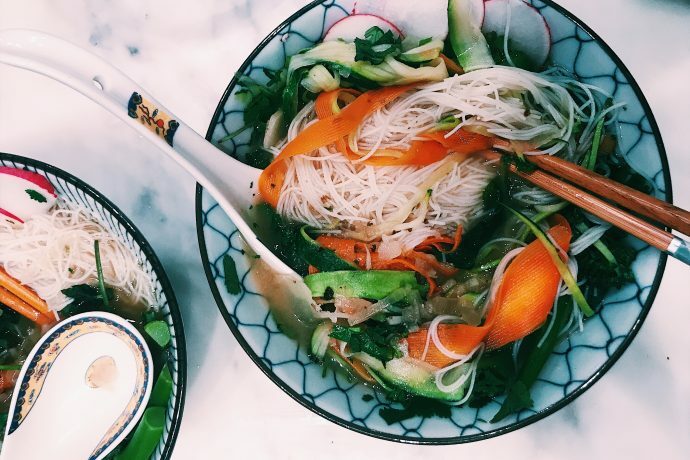 When spring is around the corner and you want something cleansing yet also nourishing and grounding, nothing is better than this herbaceous noodle soup with tons of alkaline vegetables and a mineral-rich vegan broth. I find this soup so detoxifying yet also indulgent and the perfect answer to an extra lean meal without feeling deprived. In a large stockpot, combine sliced onions, garlic, ginger and dulse leaves. Cover with water and bring to a boil, then simmer covered while you chop the rest of the vegetables. Chop off rough stems of broccolini. Slice each floret in half, length-wise. Using a vegetable peeler, peel carrots, discard rough skin and continue to peel into”noodles”. Using a serrated vegetable peeler, peel zucchini into “noodles”. Peel potato and slice thin with a knife or on a mandolin. Place potato slices in ice cold water with some cubes. Set prepped vegetables aside. Boil 4 cups of water in a separate pot. Remove from heat and add in vermicelli noodles. Let sit, covered in water, for about 5 minutes until cooked. Drain and set noodle aside. After about twenty minutes of broth simmering, add miso paste, bring to a boil, then simmer again and stir until miso is dissolved. Taste and season with tamari as you like. Drain potato and add shaved potato slices to broth and cook for about 5 minutes until tender. Then add broccolini and cook until tender but still crunchy and bright green. Remove from heat. Add mushrooms, bean sprouts, carrots and zucchini. In individual deep soup bowls. Assemble noodles first. Then ladle in soup with vegetables over the noodles. Top with fresh herbs, chili pepper and a dash of tamari with lime wedges. Serve hot.